TravelEurope Liverpool hotel reservation service provides you with a wide variety of lodging and hotel options, from cheap hotels to luxury accommodation in Liverpool. Quick and easy hotel reservations with instant confirmation and great value for money whether you travel for business or tourism. Select travel dates and find all available hotels in Liverpool, check out guests reviews and locate properties on Liverpool city maps, book your favourite accommodation with no pre-payment. All rates are in Euros and inclusive of all taxes. Bridgestreet at Liverpool ONE is located in Liverpool just inside the Liverpool One shopping mall. It offers easy access to Central and Lime Street Stations as well as James Street and Chavasse Park. Hard Days Night Hotel is located in Liverpool, in the charming Cavern Quarter, a short distance from the famous Cavern Club. This luxury boutique hotel has a fun Beatles theme decor. The Holiday Inn Liverpool City Centre is located in the heart of Liverpool, close to Lime Street train station and shopping centers St John's and Liverpool One. A mile away is the Albert Dock. 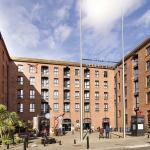 The Express by Holiday Inn is located in Liverpool within the historic warehouses of the Albert Dock. A short stroll leads you to the vibrant Liverpool Town Centre. 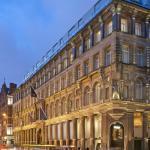 Liverpool Marriott Hotel City Centre overlooks the picturesque Queen Square, Liverpool, close to Lime Street station. The hotel boasts a gym and indoor pool. The restaurant serves tasty traditional British cuisine.